I worked the Syria topic for 15 years, 1985-2000, writing one major academic study, two monographs, and many journal articles, newspaper articles, and book reviews – in all, about 100 publications. Because of my hostility to the regime, however, other than two visits to the country as a student in 1972 and 1973, I was not allowed to return, even when such august institutions as Reader's Digest and the U.S. government sponsored my travel. 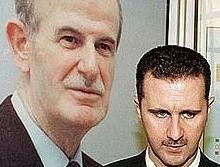 The death of Hafiz al-Asad then brought my Syria specialty to an abrupt end. This monstrous but fascinating leader had intrigued me, especially his quasi-surreptitious pan-Syrian ideology, his double-game playing, and his ability to make Syria more important than it should have been. Just over a year later, the enormity of 9/11 further wrenched me away from matters Syrian. A poster of Hafiz next to the actual Bashshar al-Asad.